I haven't found anything like this and wonder if anyone else has - this would be particularly useful for powerleveling, but useful for anyone who wants to fast-travel via death. Ideally a toggle-able option that shows up on the main large map, giving a shaded area that shows each Spirit Healer's "death range" where if you die within that shaded zone, you will rezz to that specific healer. Separated by different shades. It’s not an addon, but you can use https://classicdb.ch for this. It will display quests by default but right under the map there’s a few toggle options. Spirit Healers are the furthest right option. That's exactly what I have used. It's a bit tedious, and still doesn't *quite* capture the information I'm looking for specifically. If you misjudge the distance, you're set back very, very far. Something that is "fool proof" to an extent would be invaluable to me. Thanks for the information though - that website is great and I've used it for all sorts of things- I've even mapped out like 10+ zones worth of rare spawns to farm on servers before. I wonder if there's any easy way to look within the DB files for this information and then map out the 'areas' onto zone map graphics to be used as a static reference. That's my exact thought. This would be immense, and should be a very, very desirable resource for any power leveler, and many players in general. Having the ability to toggle it when not needed while looking at the map makes it pretty painless. Well if we can get the images together with rez areas, I'm sure a sort of toggleable 'overlay' addon wouldn't be too hard (I know nothing about addon development though lol). Failing that having it in a web browser would also be useful right? Failing that having it in a web browser would also be useful right? Useful for reference, but you're still gambling a bit when dying unless you're going way into the territory of one Spirit Healer over the other. Just as having a bunch of tabs open is useful for quest tracking - an addon is exponentially better. 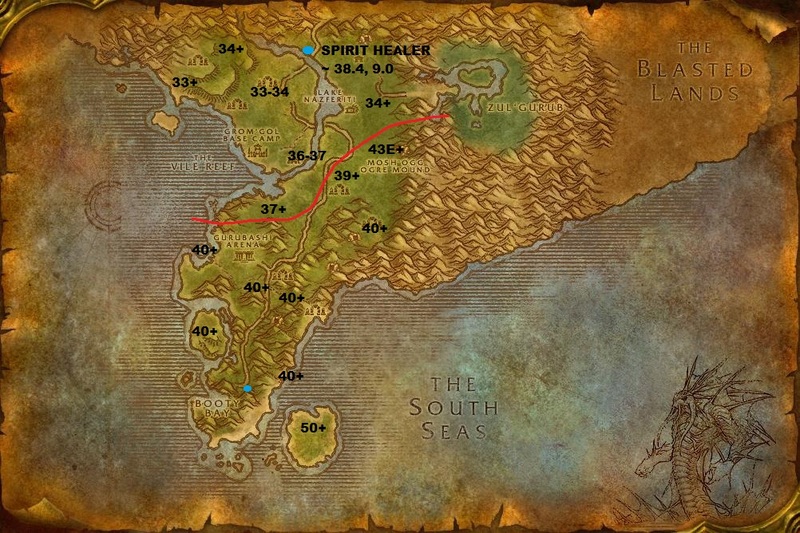 An easier alternative would be just having the Addon add POI's for every Spirit Healer and be able to use way points / coords to x/reference the distance between you and the other POI's (in this case, Spirit Healers) to see which is closer. Would be nice to get an addon for this. In the past I've just mapped individual spirit healers for... my own purposes. In the past I've just mapped individual spirit healers for... my own purposes. This is a great idea, I have a few people I am in contact with that could help with this. I did some digging thru the DBC files on the client side but I couldn't find anything that could hint towards it so I ended up looking up on server side. I found a SQL Table named game_graveyard_zone which seemed promising at first. I think this only checks what zone Id you are in when you release your ghost before you are teleported to the graveyard. I think this part is integral on what graveyard you get sent to depending on what zone you died in and releasing. 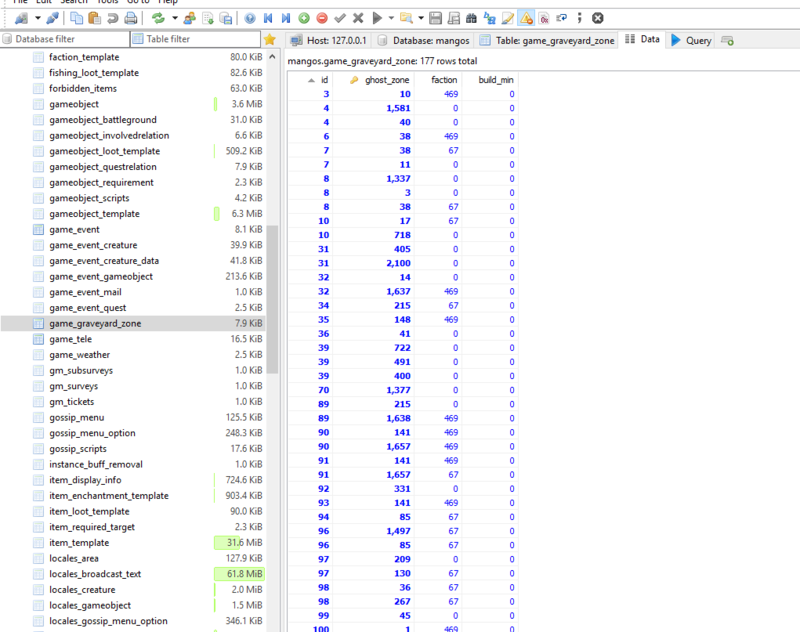 this columns data is referring to the IDs in AreaTable.dbc. I'm not sure how this works with sub zones. But I suspect that which graveyard you get teleported to when releasing has to do with what Zone and or sub zone you die and release in, which is found in AreaTable.dbc. I don't know of any ways or methods to visualize the zones. all I know they are drawn in a chunk/grid based fashions. just a quick one: is there a benifit as a druid-healer to learn first aid and level it?